I loved lemonade when I was a kid. 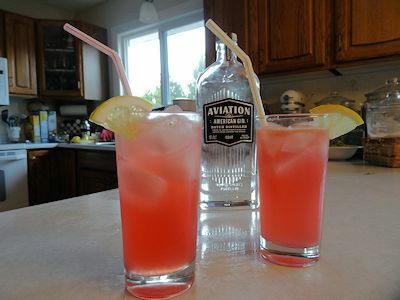 A friend’s mother used to make pink lemonade from real lemons. I don’t know the recipe but it was a real treat. We had enough Aviation gin left for one more cocktail. It was a wonderful warm day. It was time to experiment. I also like collins style drinks but they can be a little short on flavour. So, I decided to go for a collins that was closer to the pink lemonade of my childhood. I started by muddling some mint in the bottom of a cocktail shaker. I added some gin, lemon juice, pomegranate juice and simple syrup. I half filled with ice and shook hard until the shaker was frosted. 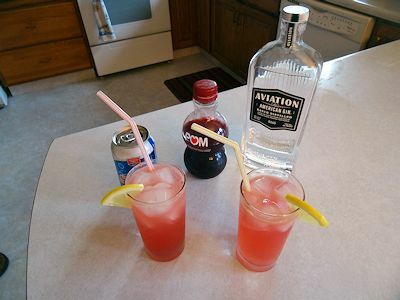 I strained the cocktail into collins glasses and added club soda. I added ice cubes and garnished with a lemon wedge. The main difference between this and a regular collins is a higher level of lemon juice and syrup making it closer to my childhood memory of pink lemonade. However, with Aviation gin in it, it was way better than my childhood memories! 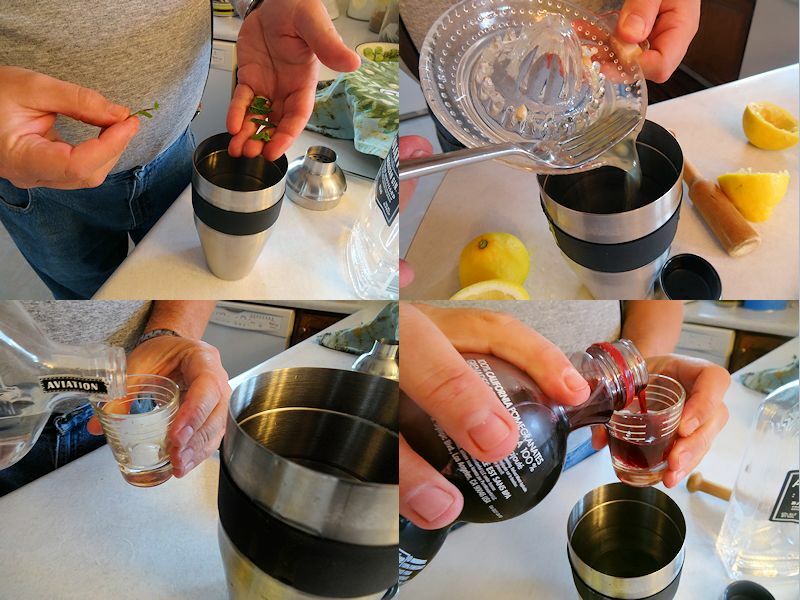 Muddle the mint in the bottom of a cocktail shaker. Add the gin, lemon juice, simple syrup and pomegranate juice. Half fill the shaker with ice and shake hard until the shaker frosts. Strain the cocktail into a tall collins glass. Add the club soda and stir softly. No gin in your childhood memories? That’s a good thing! My mother used to drink gin rickeys so I guess it is in the blood. When you’re not using aviation, do you have a preferred gin? I’ve been using Gordon’s but I’m almost out, thinking I need to branch out a bit. I used to use Bombay Sapphire Gin and enjoyed it.